I recently spoke about technical communication to a group of students at the University of Melbourne. One of the students asked about books or other resources, which sparked an interesting conversation about how much new stuff there is to learn. After you’ve got the basics, and you learn the tools, how much more is there? Well, I think there’s a lot. 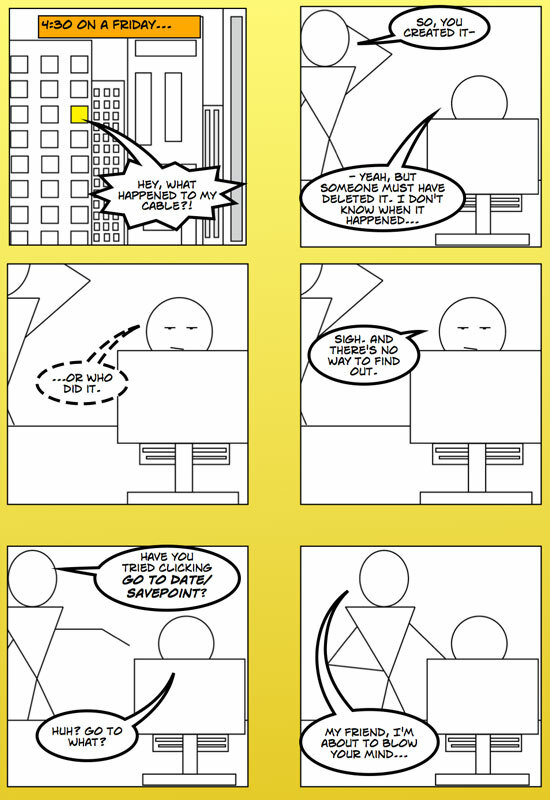 This week, I played around with a method of communication that I’d never authored before: comics. For a few years, I’ve noticed comics pop up in a lot of places that I wouldn’t have expected. For example, I own the 911 Report, the Book of Genesis, and a biography of Richard Feynman, all in comic form. But I never thought about it for my own work until it came up in an email thread about generational differences in communication. 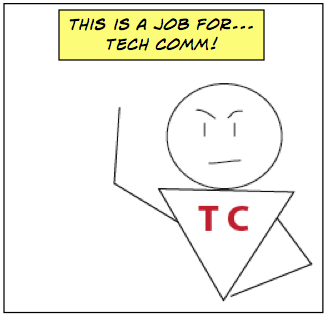 Some people recommended delving into comics for tech comm… and I did. 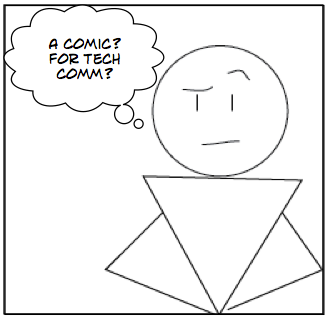 Yes, Skeptical Comic, anything that can help get an idea across can help with tech comm. When you write a paragraph explaining a feature, the reader has to look at that paragraph and decide whether to read it. Even if it’s simple, reading a paragraph takes more effort than looking at a picture. When there’s a picture as well as words, then you can write and read a lot less. Of course, I wouldn’t say that comics should replace steps 1, 2, and 3. When people want to accomplish a technical goal, they may not want to read a comic. But when the goal is simply to learn about a feature or idea, then a comic might be a good way to introduce the subject. We’ve built a feature that lets people “go back in time” to see what happened with their cable network design. The reader already has the document and knows the name of the feature, but may not have an idea of what problem it can solve. This comic is designed to introduce the idea as a teaser and whet the reader’s appetite. Note how simple I’ve made everything. I don’t really know how to draw, and I’m no expert on Illustrator or Sketchbook Pro, or anything like that. So I went with the minimum, and I hope it works. Pretty simple. Maybe too simple? I’m new to this and I’m not sure. What do you think? Can comics make a difference in the way that we help our audience learn? Let me know! Note: The book I’ve been reading is See What I Mean, by Kevin Cheng. Fabulous – it works! I was planning to try this out, but your success has given me confidence that I can do the same thing. The simple line drawings are good enough! Hey, that’s great, Christine. Of course, it was your questions that led to this whole thing for me, so I’m glad that you think it works! I m very heppy this website that can generate and so proud of any where so that is game very powerful get free gift playing card.